Notes: Diamonds sire, Ch. 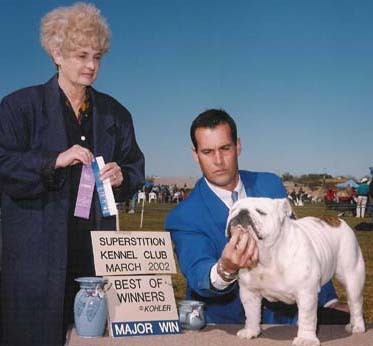 Roscoe's White Lightning (Poncho), won Best of Breed at the 1996 BCA Nationals and was a three time National Back Show Best of Breed Winner. Her dame, Ch. Aguirre's Great Balls a Fire (Maggs), was the 2000 National Weekend Best of Breed Winner. 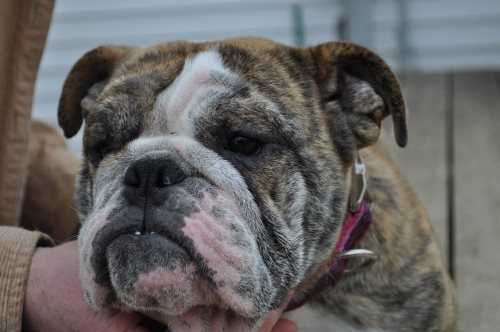 Pic of Male Pup from 1st Litter - Aguirre­s Master Blaster (Kong) - Kong is 55lb male at under a year old. Large bone and long brick head. Great temperment. Tightly line bred. Head very high showing good layback. An imaginary line should touch the lower jaw, tip of nose and top of head. LONG, FLAT forehead.